Efforts into finding new ways to tap solar energy have led to the development of solar shingles which are capable of producing energy required by a home. From the name itself, it becomes apparent that solar shingles are specially designed solar panels which look and function like ordinary asphalt shingles. Electricity produced by solar shingles is green energy that doesn’t pollute the environment in any way. If everybody swaps conventional electricity with solar energy, our earth would be a much cleaner and safer place to live. Since solar energy is a renewable source of energy, given freely by the sun, you can use it as much as you want. In the long run, installing solar shingles will save you money too. Solar shingles serve two purposes; they serve as roofing material for your home and at the same time, produce electricity for your home needs. Since they look exactly like asphalt shingles, the beauty of your roof is not affected in any way. If you can cover a large area of your roof with solar shingles, you will be able to produce more energy than your home needs. The excess energy can be sold to the power grid at a price and that ensures a steady monthly income for you. The only negative aspect of solar shingles is their price. 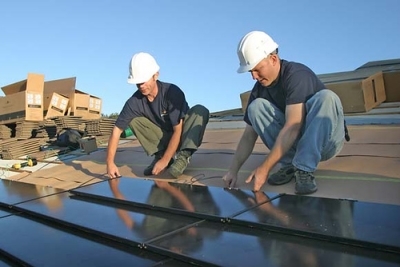 Installing solar shingles will be costlier than installing solar panels. But if you add up the cost of installing solar panels and buying asphalt shingles, you will find that installing solar shingles won’t make that much difference. Solar shingles are relatively new to the energy market. The size of solar shingles and the way the roof is made are same as that of ordinary shingles. Electricity produced by solar shingles will be more or less depending upon the number of PV shingles used on the roof. Since the solar shingles are relatively costlier, people prefer to cover only a portion of their roofs with solar shingles. The electricity produced by Photovoltaic shingles, which are inter connected, reaches an inverter which changes it into AC. Alternatively, you can store the electricity in batteries so that you will have power even when there is no sunshine. People who don’t store the power in batteries sell the excess power to the power corporation. Roughly, it will cost around $30,000 to cover the entire area of roof of an average house. This is definitely beyond the reach of many homeowners but when you take the benefits of installing solar shingles into consideration, you will realize that it is worth spending that amount. It is a onetime spending and after the initial cost, there is practically no more expenditure. Your monthly revenue from the power company over a number of years will set off your initial cost. 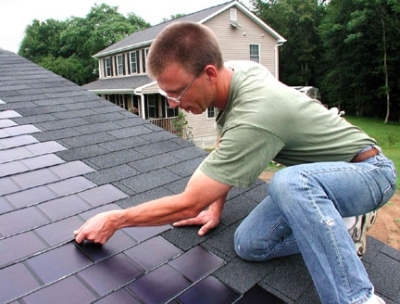 Installing Photovoltaic shingles is quite different from layering ordinary asphalt shingles. Never try to do it yourself or employ somebody who is not trained in installing solar shingles. The dealer from whom you buy the shingles will be able to provide you assistance in finding qualified personnel to install solar shingles on your roof. Two of the leading manufacturers of solar shingles are Atlantic Energy Systems and United Solar-Ovonic. The shingles produced by them differ in their power production capacity. The good news for the homeowners is that the state governments are offering incentives and tax exemptions to those who change over to solar energy from conventional energy.